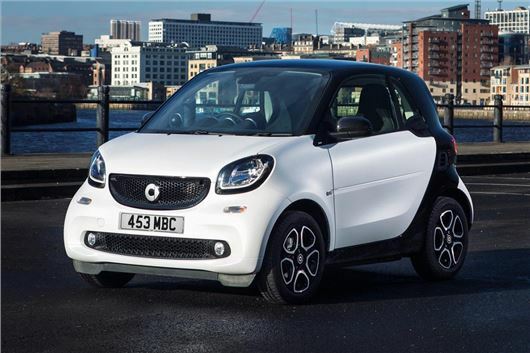 Smart has revised the Fortwo and Forfour ranges, with new trim levels including the Brabus Sport Line. Prices for the basic Passion Fortwo start at £11,125, rising to £17,295 for the priciest Forfour Brabus Sport Premium Plus. Passion, Prime, Prime Sport (which replaces the outgoing Proxy version) and Brabus Sport trim levels are offered in both Fortwo and Forfour body styles. Standard equipment includes climate control and alloy wheels. Moving up to Prime trim adds heated front seats, black leather upholstery and black alloy wheels, while Prime Sport gains a perforated leather steering wheel, 10mm lower suspension, a chrome exhaust finisher and 16-inch alloys. Brabus models are only available with the 90PS engine and come with Brabus styling, Brabus wheels and brushed aluminium pedals. All variants are available with an £845 Premium pack, which adds height adjustment to the steering wheel and seat, electrically adjustable door mirrors, rear parking sensors, smart media system and mirror link. Premium Plus is available on Prime and Brabus variants and adds ambient lighting, LED head lights and tail lights, cornering fog lights and a reversing camera. It costs £1345. A Twinamic six-speed dual-clutch automatic transmission is available for £995. As before there are two engine options. Both are three-cylinder petrols with either 71PS or 90PS. Emissions are 93g/km and 99g/km, respectively. I liked the for two when it was small.